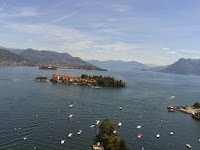 Not only is Stresa the perfect place for a holiday, but it is also the lakeside resort where holiday-makers have the chance to enjoy a nice cable car trip. In just 20 minutes you will leave the exotic setting of Stresa and lake Maggiore to be dropped off at the summit of a mountain!- Mount Mottarone - which lies just behind Stresa and offers a breathtaking sight. From the summit of Mottarone there's an exceptional panoramic view: the Alps' high peaks, seven lakes and the Po plain. The cable car ride is a thrilling experience. As the cable car moves forward the scenery changes quickly. You will soon leave the palm-trees and mediterranean and exotic greenery of the lake to glide above huge Norway spruce and beech forests. Near the first stage of the cable car line are the nice Alpinia Botanic Gardens with a selection of hundreds of alpine species. From the gardens an astounding view over the Borromean islands is guaranteed. From this stage (Alpino) a second cable car takes you up nearly to the top. At the end of the cable car line there are two options: walking to the top (it's a fifteen- minute walk) or taking the chairlift. 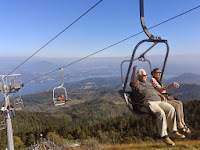 After a nice stroll in Stresa, we will reach the cable car station and we will enjoy a ride to to the top of Mount Mottarone where you will be able to enjoy panoramic views learning about past activities and about the surrounding areas enjoying a little walk. On the way down chance to stop at Alpino for a visit to the Alpinia Gardens. This tour can start at the time you like. Get a tailor-made itinerary and quote. A private tourist guide to enjoy more! About - Travel in style with tour guide Micaela!